My answers to the SP10 Questionnaire are up and over at my "100 Things about me" page! 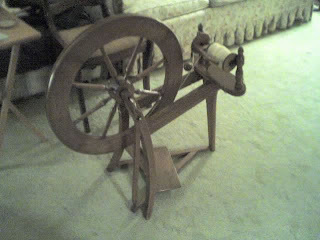 There was indeed a lady in the knitting and spinning guild who had a wheel she didn't need anymore. 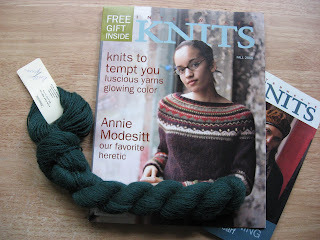 I picked it up on Wednesday at one of our LYS's here in town (she's one of the owners). It's an Ashford Traditional double drive. It came with extra bobbins, a lazy kate, and an high-speed flyer kit, for $250. 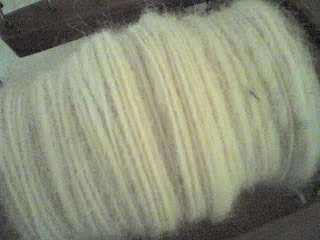 Now I need to buy some more roving (I've spun up just about all that she gave me) and a niddy noddy. In other news, I've also found some living room furniture (the red sofa and loveseat). The futon and coffee and end tables will be moving out in May. Until then I'm really pleased with how my living room looks! It's starting to look like a real home, instead of a student apartment. Now all I need are people to come over and visit and sit on the couches and just talk! I was so excited about my spinning last night that I forgot to say THANK YOU to my fabulousa Secret Pal, Viv. Thank YOU! I've had a lot of fun this go-round and I'm already signed up for SP10. By the way, do you see that soap up in the first picture? It's gardenia soap and smells wonderful. 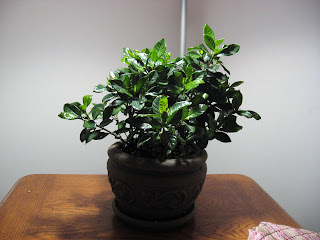 I thought you might like to know that I gave in, despite my misgivings, and bought a gardenia plant. I'd been looking for something green to put on my end table, and it was very pretty. It has lots of buds on it, hopefully it will bloom! Thanks again, Viv. You've been a wonderful secret pal! 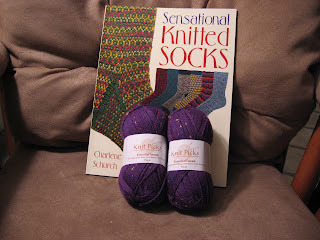 I went to the Knitting & Spinning guild meeting tonight, and had a great time! I worked on Eris and finished attaching the hem to the front. All I have left of the hem is the back. Then the lady who hosts the meetings brought out an Ashford Traditional wheel and I started down the slippery slope. 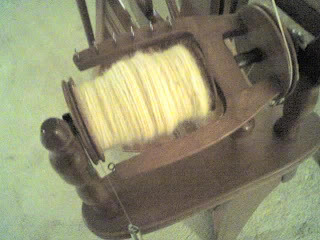 I spun nearly a whole bobbin and really enjoyed it. I want a wheel! But I have a lot of other things that I probably ought to buy first. My roommate is getting married in May, and the livingroom furniture will be moving out when she does. So I'm saving up for a couch and a coffee table and probably a loveseat. I told that to the ladies at the Guild tonight, and they laughingly said, "Why save up for all that furniture? All you need for a wheel is a chair!" I'm tempted. Very tempted. But a wheel costs so much money! I might ask if anyone at the guild has a used one they want to sell. In the meantime, I would like to make sure that this isn't just a whim. 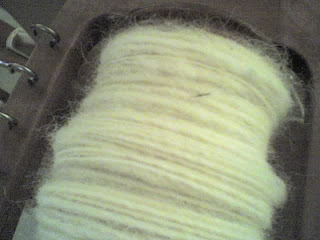 Here's the fruits of my first foray into wheel spinning. Sorry about the shoddy photos...all I had with me was the camera phone. I'm pretty proud of myself. Spinning just clicked with me. I very quickly figured out how to put the movement of my foot pretty much on autopilot, and was able to focus on drafting. Of course, I still have thick and thin spots, but that's normal. Linda, the hostess, told me that it was not regular "beginner yarn".